Rhino Horn Crisis Reaches European Museums : The Two-Way Thieves are ripping the horns off long-dead rhinos who in some cases have stood in natural history museums for decades. Driving the market: Traditional beliefs in some Asian cultures that rhino horn powder is a medicine and an aphrodisiac. 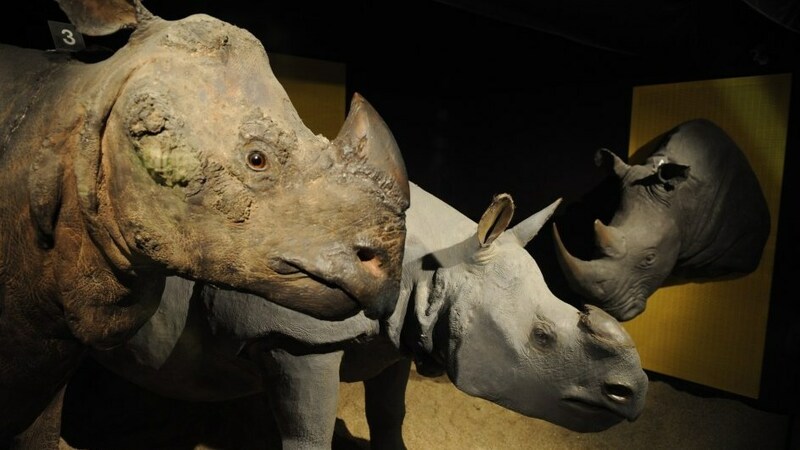 In late July, the Brussels Royal Institute for Natural Sciences Museum was among those targeted by horn robbers. The devastating toll that poachers have been taking on Africa's rhinos now has a parallel story in Europe. The New York Times this morning follows up earlier reporting by The Guardian about a rash of thefts at European museums. It's not artwork or jewels the thieves are after. They want rhinoceros horns, which the Times says can sell for more than $200,000 each. And they're ripping them off long-dead rhinos that in some cases have been in European natural history museums for decades. Driving the market: "a surge in demand from the far east and European Asian communities for powdered rhino horn, which is used in traditional Chinese medicines," says the Guardian, and the belief by some in those regions that the powder is an aphrodisiac. The crime spree may be accelerating. When it published its story on Aug. 8, the Guardian said there had been 20 such thefts from European museums in the past six months. Today, the Times says there have been "30 so far this year." As for the belief that rhino horn powder is good for you, Dr. Raj Amin at the Zoological Society of London has said there's no evidence that's true. "Medically, it's the same as if you were chewing your own nails," he told PBS' Nature program in 2007.